Wissenaire,the annual Techno-Management fest of IIT Bhubaneswar is being organized by it's students on February 1-3. Wissenaire'19 is replete with 3 days of enriching and informative talks, exhibitions, workshops, and exciting events and competitions along with nights of entertainment and fun. Wissenaire'19 has been designed along the theme “Augmented Reality: The Perceptual Enhancement of Reality for the Genesis of Anthropocentric Technology" and has included dedicated talks and events for the same. 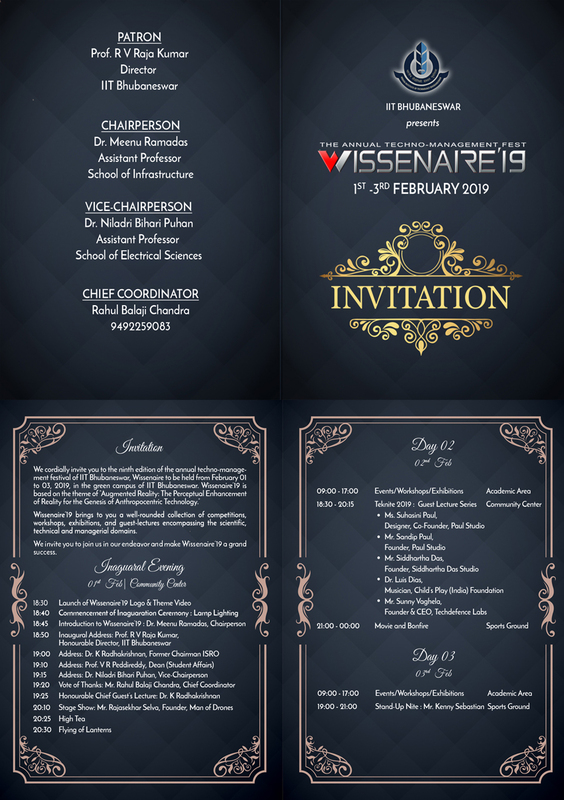 The inaugural ceremony of Wissenaire'19 is on February 01, 2019, at 6:00 PM in the Community Center at IIT Bhubaneswar Arugul campus and will be blessed with the august presence of Dr. K Radhakrishnan, former Chairman, ISRO and Hon. Distinguished Advisor, ISRO, who will be delivering the Chief Guest’s lecture on the topic “Augmented Reality and Human Space Exploration-Emerging Trends”.The fest also features talks by eminent personalities like Paul Sandip, Suhasini Paul, Sunny Vaghela, and Luis Dias.The event concludes in the third of February with the King of Stand-up comedy Kenny Sebastian, putting on a show with his wit and comedy.